Sometimes, describing a bug in words is tedious. Other times it's simply impossible. If there's a subtle problem with control rendering on one version of Windows, for example, you don't want to have to specify the number of pixels that you think are wrong on the vertical lines. A much better choice is to take a picture and attach it to the bug report. Fortunately, FogBugz supports its own Screenshot tool for either Mac or Windows desktops. To set up the Screenshot tool, log on to FogBugz and click the Capture Screenshots link on your FogBugz home page. This will take you to another page from which you can do the actual download for your operating system. 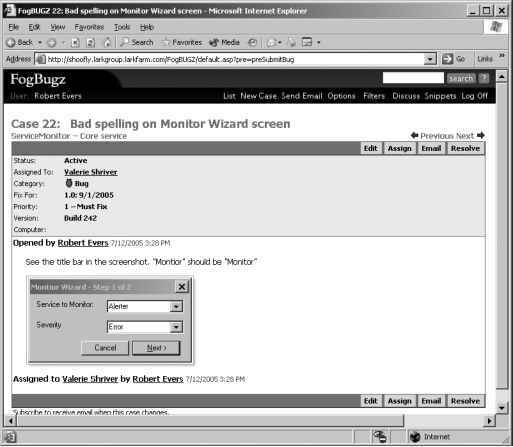 After downloading and installing the program, you'll have a bug icon on your Windows taskbar, as shown in Figure 2-11, or a bug icon on your Mac menu bar, as shown in Figure 2-12. The Mac and the Windows version of the Screenshot tool are almost identical but differ in small ways. After you've installed the Screenshot tool, click the bug icon to perform a capture. A single click is all it takes. On Windows, the Screenshot tool captures the active window by default, as shown in Figure 2-13. 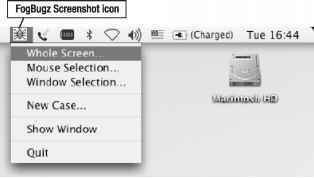 On Mac OS X, select the bug icon in the menu bar at the top of the screen, and then choose Whole Screen, Mouse Selection (for just part of the screen), or Window Selection (to grab a specific window). If you choose Window Selection, the cursor will change to a camera, and then you can highlight and select the window you want, as shown in Figure 2-14. After you take a screenshot, you can use the hyperlinks to the right of the work area to modify the screenshot. On Windows, you can crop the screenshot (making it smaller) or highlight an area to illustrate where the bug appears (which surrounds it with a bold red rectangle). On Mac OS X, you have to crop before you take the screenshot by choosing Mouse Selection, but you can still highlight the screenshot after you take it. Then you can decide whether to submit the screenshot as a new case or to attach it to an existing case. To attach the screenshot to an existing case, you must know the case number. 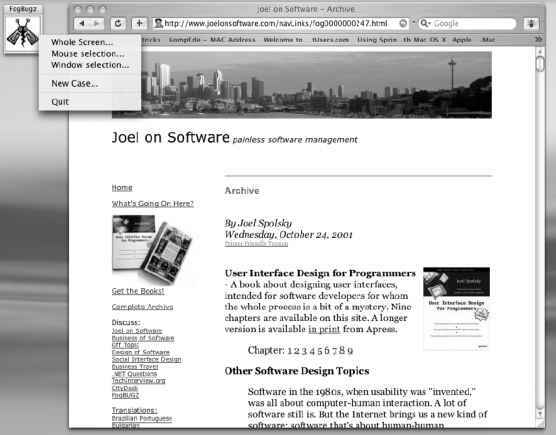 Figure 2-15 shows a case with a screenshot; the screenshot shows up directly in the browser when you view the case. • Capture Screenshot Now: This is equivalent to just clicking the tool. 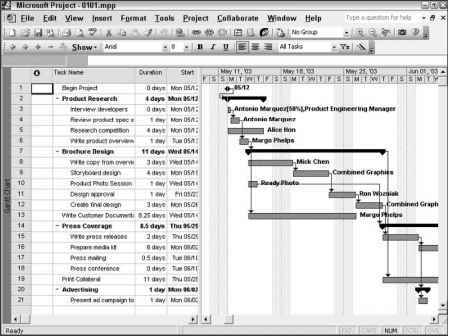 • AboutFogBugz Screenshot: Shows information about the program. • New Case: Opens a browser window ready to enter a new case. This is the fastest way to start a new case if you have the Screenshot tool running. Exit: Removes the Screenshot tool from the taskbar and closes the application. • Whole Screen: Captures the entire desktop window. • Mouse Selection: Captures a specific piece of the desktop. • Window Selection: Captures a specific window. • Quit: Removes the Screenshot tool from the menu bar and closes the application.